Strong acting and genuine heart make this American remake as good as the French original. Phillip Lacasse (Bryan Cranston) is a quadriplegic billionaire. He’s grumpy about his condition and just wants to die and join his beloved wife who died years earlier. He’s also not fond of being doted on and catered to, so he fired his most recent caregiver… forcing his assistant, Yvonne (Nicole Kidman) to put out a job ad to fill the position. Dell Scott (Kevin Hart) is an ex-convict looking to move on with the next stage of his life. He’s out job hunting, but his heart’s not really in it. He doesn’t really want any of the jobs he’s applying for, just trying to get signatures to show his parole officer that he’s trying to find work so he doesn’t get in more legal trouble. His fruitless search eventually leads him to Phillip, where he thinks he’s applying for a janitorial position. Phillip is amused by Dell and, just to spite Yvonne, offers him the job as his new caregiver. With the help of Yvonne and the rest of Phillip’s staff, Dell learns the ropes of caring for his new billionaire boss and getting acclimated to living in the lap of luxury. Dell takes his checks to his ex-wife (Aja Naomi King) and attempts to restart a relationship with his son (Jahi Di’Allo Winston). Throughout their relationship, Phillip teaches Dell about things like respect, opera, and the arts. Dell teaches Phillip about having fun and being more confident with his relationships and that he could, if he wants to, find love again. The Upside was directed by Neil Burger, making a giant leap from recent sci-fi flicks like Limitless and Divergent. It hearkens back to his last straight drama The Lucky Ones (starring Rachel McAdams and Tim Robbins), but easily blows that previous credit out of the water. This movie has heart. It’s intense. It’s funny. It’s thematic. It’s basically anything you could want in a movie – except for explosions… but there is a car chase! The entire cast is brilliant. Dramatic beats and comedic moments are played with flawless precision that will make audience members run the emotional gambit. The cinematography by Stuart Dryburgh (The Post, The Secret life of Walter Mitty) is stunning. But, of course, all his stuff is beautiful which is why he gets hired to lens so many projects! 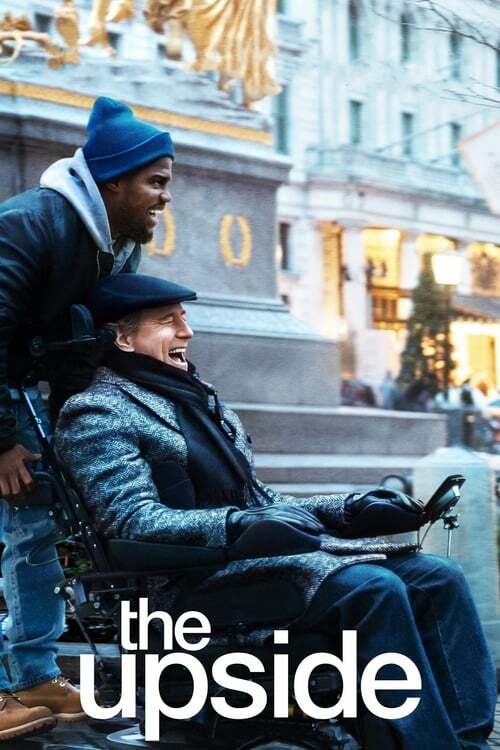 It’s just a shame most Americans who see The Upside won’t know it’s actually a remake of an earlier 2011 French film – The Intouchables (written and directed by Olivier Nakache and Eric Toledano, based on an autobiography by Philippe Pozzo di Borgo). It wouldn’t surprise me if Jon Hartmere gets considered for an Oscar for writing The Upside… but it will frustrate me. I mean, kudos to him for getting on this project as his very first screenwriting job, but this movie is an almost scene-for-scene duplication of Nakache and Toledano’s film. A few details have changed (names, Dell’s son is his cousin in the original film, and the ending is slightly different), but is that really enough to say he wrote this? It’s more like he copied someone else’s homework assignment and then changed a few words here and there before turning it in. There are a few parts in the film where the pacing slows a bit, giving the impression it was losing steam and wasn’t sure where to go from there. This is a problem comedies sometimes have where they’ve played out all the jokes that come inherent with the initial concept, but still need to fill out a feature run time (126 minutes in the case of The Upside). Luckily, those moments were short-lived, and the movie managed to get back on track. Admittedly, this could have stood to be about 10-15 min shorter and not suffered for it. The Upside is definitely a quality film, but then, so was the movie it’s a remake of. The Upside cost $37.5M to make and pulled over $20M in its first weekend to make it the #1 movie in the country. But I doubt it’ll manage to do what its predecessor did. The Intouchables had a roughly $10M budget (when figuring the French to American conversion), yet pulled in over $426.5M worldwide during its theatrical run. In just 9 days, it became the second-highest grossing movie in French history. Will The Upside perform as well? Probably not. But it’s just as good a film, in my opinion.